Heat 1 tablespoon of olive oil over medium-high heat in a cast iron skillet. Add the onions and cook until they begin to soften and turn translucent – about 3 minutes. Add the potatoes and stir so that they mix with the onions and everything has a chance to lay against the hot surface of the pan. Lower the heat to medium. Continue poking at the contents of the pan occasionally and stirring when it feels right until the potatoes look a little less opaque and start to feel soft when you jab at them with a fork. This should be somewhere in the 5 minute neighborhood, depending on how big a pan you’re using (if you use a big skillet, and everything has a chance to lay flat, it will cook faster than if the skillet is small enough that things get a little stacked up). 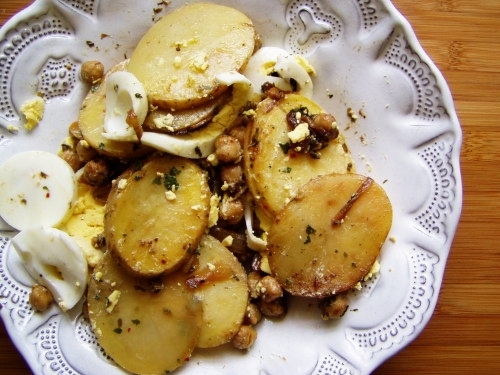 Once the potatoes are cooked, rinse and drain the chickpeas and add them to the pan. Stir everything well, cover, and turn off the heat. Roughly chop the parsley and capers together. Dump them in a small bowl and add the red pepper flakes, garlic, and vinegar. Slowly drizzle in the remaining 3 tablespoons of olive oil while you whisk everything together with a fork. Take the lid off the skillet and pour in the salsa. Toss everything together gently with a spatula or wooden spoon and sprinkle with the gruyere. Give it a minute, so the radiant heat from the potatoes can soften the cheese, and stir. If you feel like adding hard boiled eggs, slice them into thin disks and gently fold into the mix. This looks oddly delicious. I think I will love it, and I think my husband just may like it himself, although I would never in my life put all these ingredients together on my own. I’m looking forward to making it! Oddly delicious is totally the way to describe these ingredients. Totally bizarre combination, but it really works. Enjoy! The Salty Spoon is powered by	WordPress 2.7 and delivered to you in 0.216 seconds using 24 queries.